Dr. Dongmei Wang has opened a new Regional Cancer Care (RCCA) medical oncology practice at 9715 Medical Center Drive, Suite 531, Rockville, Maryland. This expanded practice is staffed by trained medical professionals to provide patients with individualized chemotherapy infusion services. 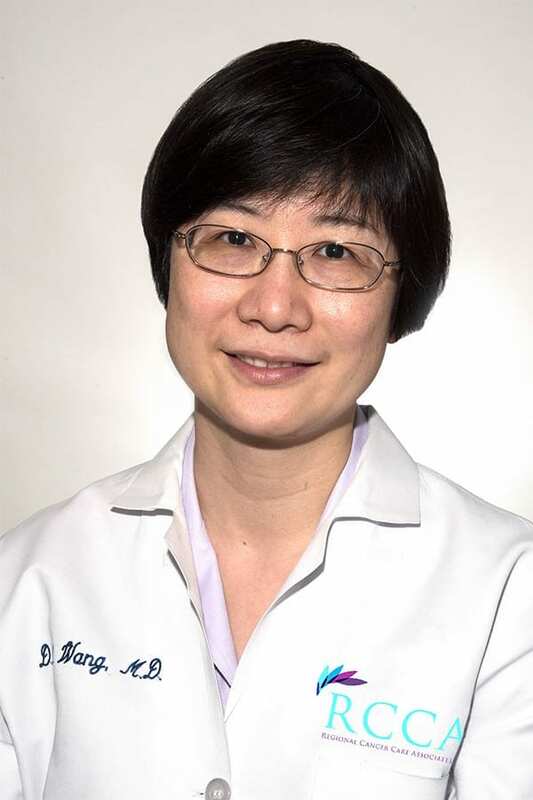 Dr. Wang, who specializes in lung and gastrointestinal cancer treatment, began her career in oncology research as a graduate student, when she followed several clinical trials for investigational chemotherapy and immunotherapy. Several treatments now commonly used in oncology began with these trials. Dr. Wang received her medical degree in Beijing, China, before completing her internal medicine resident at St. Vincent’s Medical Center in Bridgeport, CT, and the College of Physicians and Surgeons at Columbia University in New York City. She received her fellowship training in medical oncology and hematology at the National Cancer Institute and the National Heart, Lung & Blood Institute in Bethesda, MD. “When I started here eight years ago, we were a very small practice, and we are still relatively new,” Dr. Wang said. “Over time, we became established by providing good service to our patients in the community. The primary care physicians, surgeons and other referring physicians have come to know us refer their patients to us.” She also credits the support of Regional Cancer Care Associates in helping her practice grow. Contact the new RCCA Rockville, Maryland office.